If you climb up an ice fall a pair of crampons are necessary - unless you’re Superman and just fly up (where’s the fun in that?). As I set out to climb ice, a pair of yellow Grivel G20 crampons arrived at La Maison Morkel - they are the lightest crampons available, thus it was an easy choice! A Living Review. 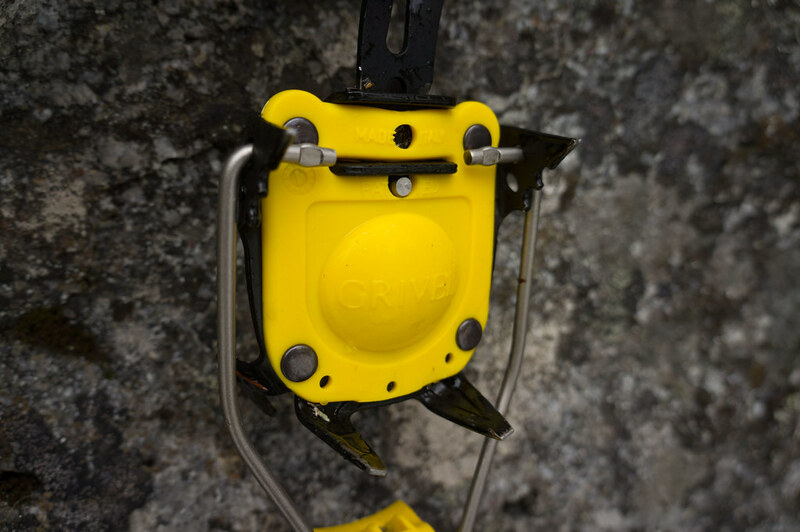 The Grivel G20 crampons have been used for seven full days of ice climbing. This review should be considered as an initial review, which I will update during the next winter season when I have got more use with them. Their function is to add more traction if you’re traversing glaciers, are climbing in the mountains and on ice falls. During the course of this year they will likely be used for all three of these activities, though thus far they were used on approaches and for ice and mixed climbing. 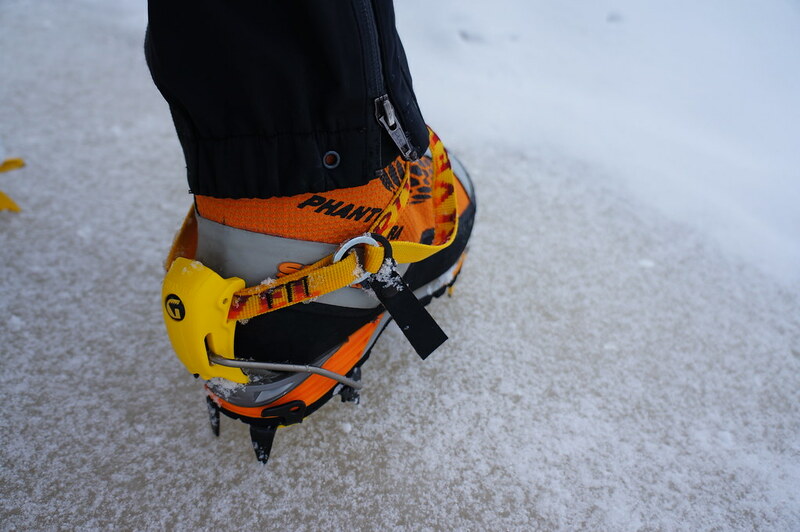 Fitting the G20 to my Phantom Ultra boots was super easy: In the back you lift the small lever to adjust the length of the crampon to your boot - they suit boots from size 37 to 48. Once the correct length was found I simply slid the boot in the front wire bail, pulled the Cramp-O-Matic lever up and adjusted the tightness via the small dial to the correct fit. Then just close the safety strap and you’re wearing the crampon! 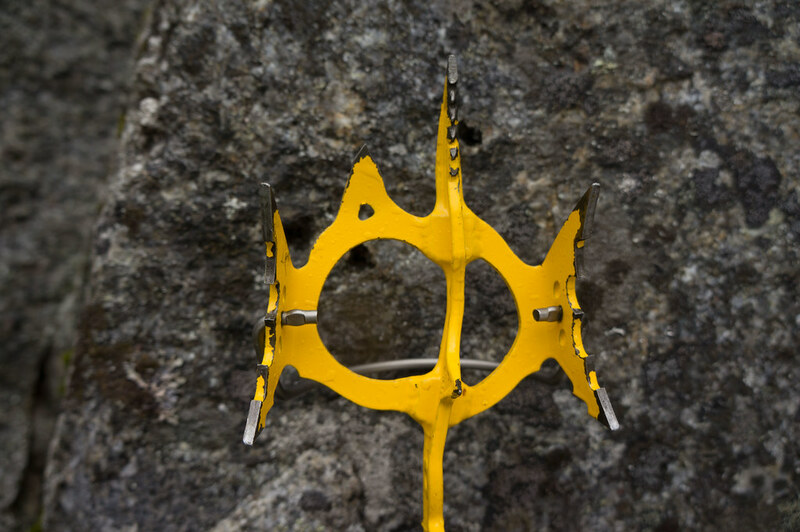 The pro-active anti-balling plate (or Antibot) is the first of its kind: It gets rid of the snow with every step taken, using its flexibility and the climber’s movement. The Mono-Rail technology distributes the 11 points in an intelligent and original way, with two points under the middle foot. There’s less bulk because of the Mono-Rail and when not used the crampons pack in a small, tight package. The G20 crampons are Made in Italy. Grivel has made it one of their hallmarks to produce their equipment in Europe. For me the G20 are impeccably made, with lots of attention to detail and innovative ideas. So far I haven’t observed any faults or problems with them. 848 g for the pair or 424 g per crampon. That’s 54 gram over claimed weight, but still acceptable. 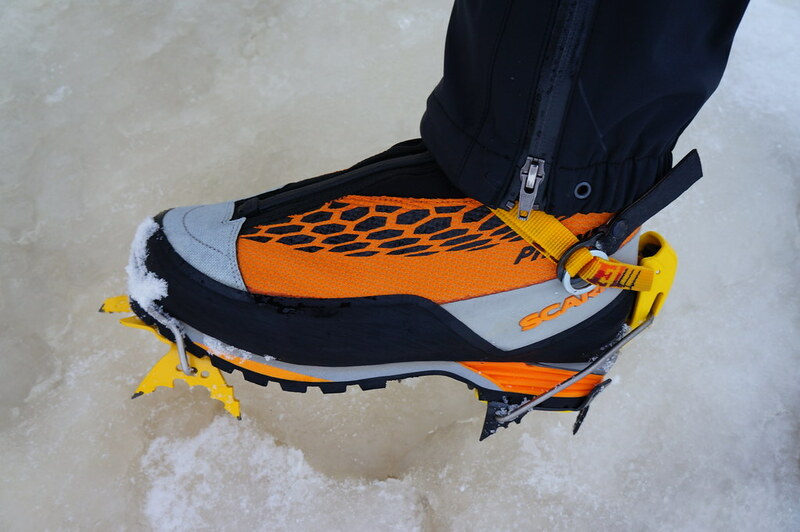 Together with my Phantom Ultra that makes a combined weight of crampon and boot of 1342 gram per foot. The materials used in the G20 are Chromolly steel, Dyneema for the strap, and a bit of plastic and nylon. 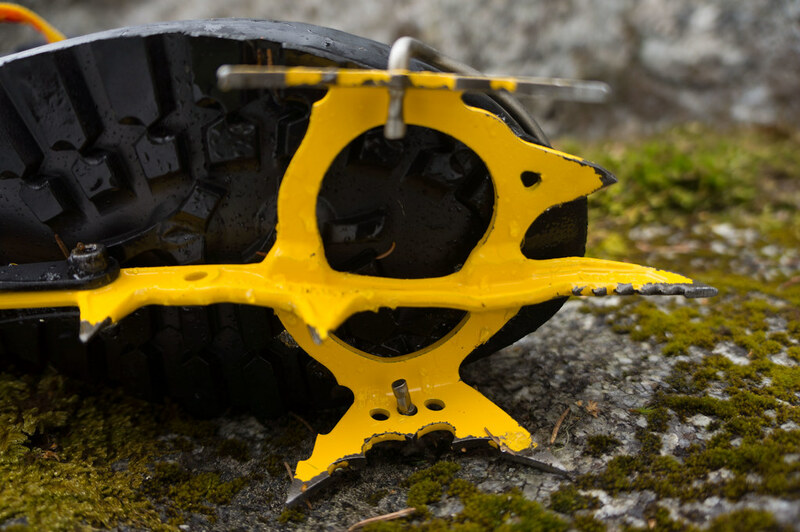 With the right tools you can take apart the different parts easily and could recycle the crampon easily. 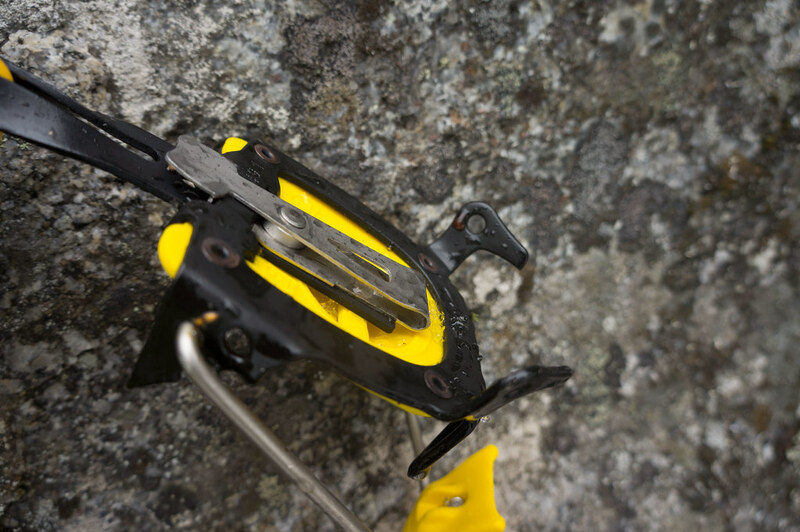 “Why Grivel and not Petzl or Black Diamond crampons?” some might be wondering. Well, I find Grivel a very sympathetic company, and it’s a company which since 1818 produces mountaineering equipment in Italy at the foot of the Mont Blanc. They have quite a few innovations to their name, and still continue to produce amazing equipment for Alpine adventures. And with the G20 crampons being the lightest crampon on the market it was an easy decision for me to get them. They G20 crampons were super easy to fit my boots, are a compact and light package when not worn, are very easy and fast to put on, and perform for me very great on the ice, mixed and on approaches. On the Abisko Ice Climbing Festival I tried a pair of Petzl Dart mono-point crampons, though they didn’t feel as stable as my G20s. The small extra front point and their asymmetrical design work very well for me, and climbing in them was easy and good fun. There seems to be some discussions that mono-points aren’t a good choice for beginners, as Dual Points are considered more stable on the ice. I haven’t tried Dual Point crampons yet, so can’t comment on that, though I imagine there’s some truth to that. Mono-points on the other hand are considered the best tool for mixed and harder routes. As a beginner I felt that the G20 were a good choice, and while there were blow-outs these were most often because of sloppy placements and not because of a missing second front point. Climbing ice and mixed with the G20s felt agile and precise. Especially on rock the mono-point was superb, and the third points were useful for hooking on rocks. On ice the front point was easy to place well, and the second points were, after I reminded myself mentally of a heels down easily connecting to the ice and making for a secure and good stand. Because the non-modular points of the G20 need to be sharpened to stay useful for climbing, they get shorter with wear. This means that after a couple of years (or however much one climbs/ sort of climbing) a new pair will be needed, or you just replace the front piece. The steel used in the G20 is of a high quality, though, and should keep me climbing for a couple of seasons without problems. 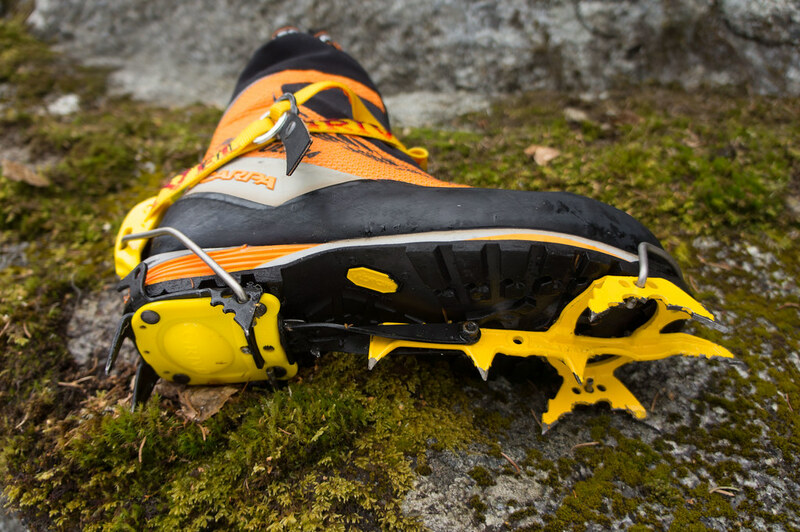 Furthermore, these one-piece forged crampons are lighter than modular crampons where you can switch the front points. Also, since there are no moving parts, you don’t have to worry about screws coming loose or something which could go broken. 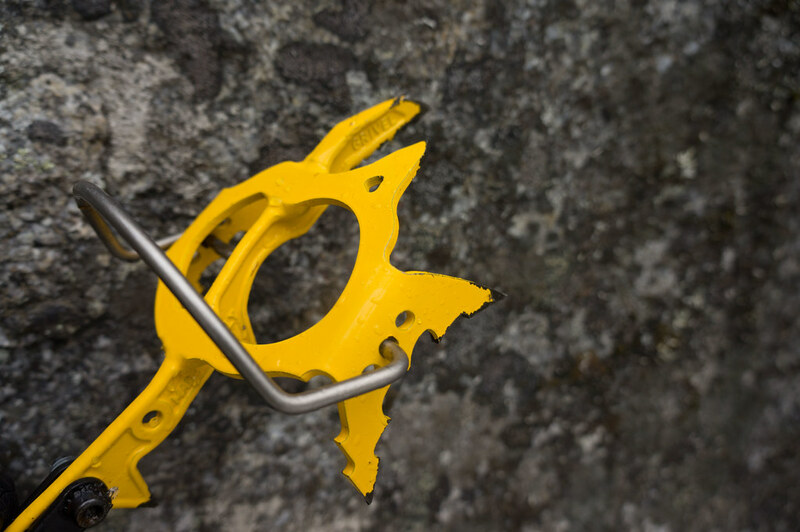 The Petzl Dart and the Black Diamond Stinger are both mono-point crampons, weighing claimed 824 g and 940 g respectively. The Stinger has an Antibot included, the Dart hasn’t - that’s extra weight coming on top to avoid balling. 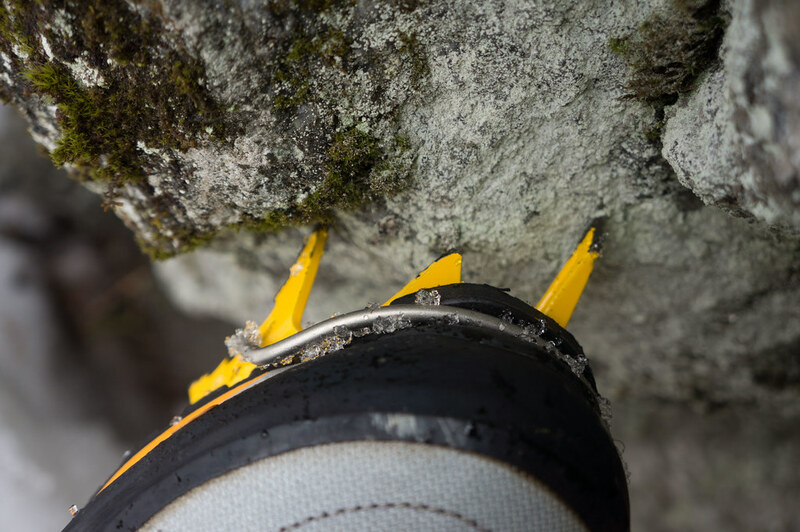 Also the Cassin CC is a mono-point crampon and has a claimed weight (without Antibot) of 850 g.
Dave Searle reviewed the G20 on Cold Thistle and he rates the G20 very high for climbing ice and mixed - read his review to gain further insights on how great these crampons are. The G20 are also Viv Scott’s Pick of the Season in this UK CLimbing article (scroll down). I am very happy with the Grivel G20 crampons. Lightweight, nimble and precise in use, compact and light when carried, fitting my boots perfectly, these were for me the right crampons to start ice and mixed climbing with for me. They’re impeccably made, the Antibot works great and snow building up underneath the crampon is not a problem. The G20 stay sharp rather well and I only needed to take a file to them twice - if you do more mixed or walk over rocks this will be more, obviously. All things considered a superb crampon for what I am doing, and if you’re looking to start ice climbing and want the lightest crampon on the market - then look no further: The Grivel G20 is a great crampon and very light. 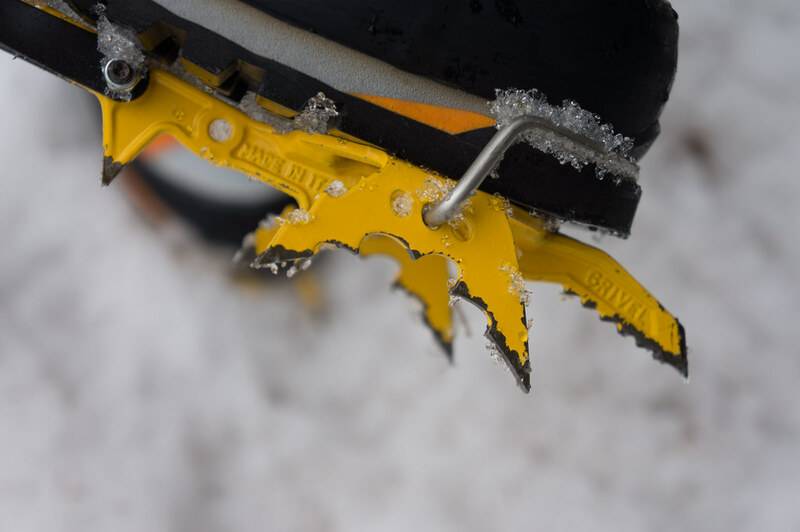 Plenty more photos on Flickr Great intro article about crampons on REI. At Bergzeit they are currently 10% off and cost only 180€. * One of these statements is not true.